Rain gutters are a crucial part of any home's exterior. A gutter's main purpose is to direct water that runs off the roof away from your home. By directing the path of the water, you help to avoid leaks and rotting of the soffits and fascia around your home. While some specialty forms of gutter must be installed by professionals, it is possible to install basic rain gutters yourself. 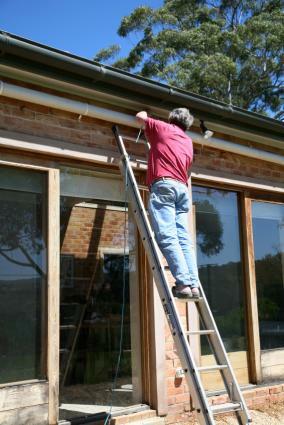 Before you begin installing the gutters, take a few minutes to walk around the perimeter of the house. The gutters will feed down into a spout, which will direct the water away from the home. Ideally, the spout or spouts should be installed on a corner of the home where the ground slopes away from the foundation slightly. This will ensure the water does not seep back into your basement. Take careful measurements of the perimeter of the home, mark each inside and outside corner and determine where the spouts will go. This should be done before purchasing materials to ensure you get the correct amount. Locate the area on the side of the house where you will begin your first run of gutters. Measure down 1/2 inch from the edge of the roof and place a chalk mark on the wall. Move to the end of the run of gutters and measure down 1/2 inch on this end. Use a level to check that the area between these two spots is level and make adjustments if necessary. The gutters will be installed at a slope of 5/8 inch for every 10 feet of gutter. Calculate the slope and mark the wall with chalk to give yourself a visual guide as you install the gutters. Attach the first hidden gutter hanger to the wall at the start of the first run of gutters using galvanized screws. Attach the next hangers every 16-inches around the perimeter of the home. Attach the end of the first run of gutters and begin moving the gutters along the roof line following the chalked slope. Attach the gutters to one another using the screws and connectors at each point. Use a hacksaw to cut through any lengths of gutter that are too long for the home. Use inside and outside mitered gutter corners at each turn and bend to move seamlessly around the home. Finish a run of gutters by screwing an end cap to the open end of the gutter. Drill a hole at the end of each run for the drain spout. Drill a 1/4-inch hole in the spout on the bottom, then, drill the 4 inch hole down from the top and attach an outlet cap to the bottom to help attach the gutter to the spout. Use spout elbows to bend the spout away from the gutter to help direct the water away from your home. Run the spout down the side of the home, using pipe strap to secure the gutter to the home. Use a final elbow at the bottom of the spout to direct the water away from the foundation of the home. Fill in the connectors between each piece of gutter with exterior silicone caulk. Run a small bead between each connector to form a waterproof seal around the gutters. Installing a set of gutters takes approximately six to eight hours depending on the size of your home, but can save you a lot of time and money from water damage. Check your home's gutters regularly if they are rusting, bent or otherwise not doing their work. Replace them as soon as possible. Your home's integrity depends on it.